I drove to church last night, and it was spring. I rolled the windows down to listen to the frog symphony performed from the water-filled ditches along the road. The breeze fluttered through my hair. The sun peeked out around a few lonely clouds defying them with his glorious hues. Just a few days ago the ground was covered in white and the temperatures required coats, beanies, gloves as well as extra socks – winter asserting its power. The spring-like weather was a simple peek-a-boo that evening. Today the sky is once again all gray and pouring out iced rain and snow. Winter isn’t giving up so easily. Even though it was only for a few hours, the hint of spring renewed me. I suddenly remembered the sun’s warmth on my face, the freedom of shorts and a t-shirt, the leaves dancing in radiant green as balmy breezes brush over them. The doldrums of gray days, biting winds, and painful shivers wouldn’t last forever. And so it is with any winter. No matter if winter comes dressed as an unexpected illness, sudden tragedy, or ill-prepared life change, the hard part cannot last forever. The ground must thaw. The trees must relinquish their buds. The sky must perform the sun’s show. All becomes new once again. There are moments in life when the winter seems interminable, and then out of the blue a hint of spring fills our soul. Spring might come in the form of an encouraging word from a friend filled with the exact words you needed to hear. Or it could be an unexpected blessing of money, friendship, or beauty. Sometimes it shows up as laughter, a song, or a smile. It’s those hints that renew our souls again. Give us strength to turn our shoulder to the winter wind and push through another day. We know spring is coming; it always does. That’s how God designed the earth. It’s how he designed our walk with Him. 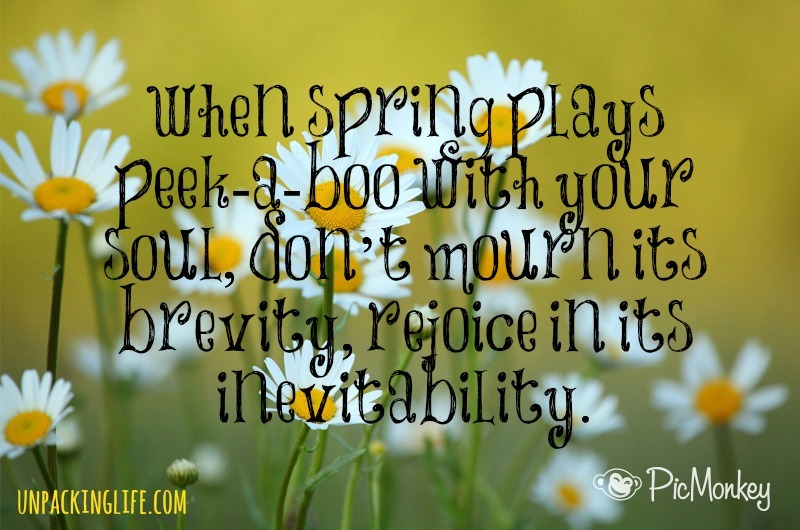 So when spring plays peek-a-boo with your soul don’t mourn its brevity, rejoice in its inevitability. Recently, life has been difficult for many different reasons. Our family is living in a tough stage of ministry – the one where all you do is wait and long. But with that one glimpse of spring, God allowed me to remember all the times he has sent a hint of spring my way, especially in the area of my missions journey. He reminded me that seasons must change; it cannot remain cold and dreary forever. Those moments when spring peeks through let me know that good things are coming, the landscape of my life with burst forth again with color and warmth. So I cling to this thought and choose to travel in hope toward the oncoming spring. This entry was posted in Faith Builders, Missions, Spiritual Encouragement and tagged Alicia C. Hall, Alicia Hall, Spiritual growth on March 6, 2015 by aliciachall28.